The odor control methods building service contractors use will vary depending on the market. For example, a fragrance used in schools around children may differ from one used in an office building full of adults. But differences aside, removing odor — and not masking it — comes down to four basic procedures: using an odor control product, locating and eradicating the odor’s source, frequent cleaning and keeping equipment clean. Odor control procedures change with each market. Products used in schools are different from commercial offices or industrial facilities. “With commercial office buildings, the biggest thing we have to deal with is floor drain traps that tend to dry out and allow sewer gases to come back through,” says Larry McAlpin, director of purchasing and special projects for Rite Way Service in Birmingham, Ala.
To effectively clean floor drains, it’s recommended to pour a cleaning solution down drains daily to remove P-trap odors, says Roger Ford, director of operations of Team MJV in Lafayette, Ind. There are different odor problems in educational facilities. Schools, especially elementary schools, have odors caused by urine. Toilets and urinals should be cleaned nightly. If odor is building up in urinals, they may need to be acid-cleaned and flushed out on a more frequent basis, says Lynn Krafft, CEO of Krafft Cleaning Service in Watertown, N.Y.
Floors and grout lines can also emit urine odors. They, too, need to be cleaned frequently to remove all traces of urine. Matting placed around urinals and toilets can be effective for removing urine odors as well, but they need to be replaced at least weekly; otherwise, they’re counterproductive, says Ford. Odor control methods in industrial facilities depend on the facility and what is being manufactured, says McAlpin. “They are regulated for the type of (cleaning) products that can be used,” he says. The type of building will also dictate the fragrance. Many schools use a citrus or fruity fragrance. Other facilities prefer different scents. Many BSCs provide fragrance products, but don’t promote them, instead offering the products as an add-on service upon request. 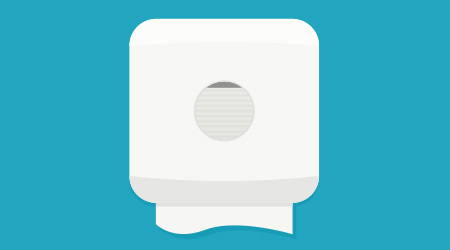 Masking odors with fresh scents will not fix a smelly restroom. Cleanliness — getting rid of odor sources — is the first step in odor control, says Krafft. Restroom surfaces should be disinfected on a daily basis to keep bacteria and odor in check, says Ford. “Studies show toilets seem to be the cleanest thing in a building because they are disinfected every night, whereas a desktop may have crumbs and other things on it for a long time,” adds Krafft. Just as important as using a disinfectant is using it properly. BSCs must provide the proper dwell time for it to work. Simply spraying and wiping will not do the job, says McAlpin. Frequent cleaning is also necessary to effectively remove all odors. As more facilities cut cleaning budgets they are only adding to the odor control problems. For example, at one of Krafft’s accounts, cleaning is skipped on Friday and resumes Monday. Restricted cleaning schedules makes it more important for BSCs to target probable odor areas. Some items needing frequent cleaning are wastebaskets full of odor-producing sanitary napkins and wet paper towels, as well as office space wastebaskets that may harbor coffee grounds and drippings. BSCs, too, can be culprits for odor. “Odors don’t always come from human waste or food particles — it could be stripping compounds, disinfectant sprays or air freshener sprays,” says Krafft. Poor cleaning practices, too, can lead to odor problems, adds Krafft. For example, if the mop head smells bad, that odor is being transmitted throughout the facility being cleaned. Vacuum bags, too, should be emptied on a regular basis to prevent from spreading odors. “If you look in the restroom janitorial closet, you can extrapolate what the rest of the building looks like, because if it’s not taken care of, guess what they’re not doing anywhere else,” says Krafft. From office buildings to schools, BSCs will need to tailor their odor control procedures and products accordingly. But in the end, nothing will remove odor problems better than thorough and frequent cleaning. Carol Brzozowski is a freelance writer based in Coral Springs, Fla. Cleaning companies are striving to attain better air quality — achieved through proper cleaning and ventilation — in odor control practices. Inadequate ventilation can be a problem in a building designed with restrooms lacking windows that open to the outside, Krafft adds. Green cleaning aligned with the U.S. Green Building Council’s Leadership in Energy and Environmental Design (LEED) standards addresses proper ventilation in restrooms and janitorial closets. Green Seal’s GS-42 certification for cleaning services also addresses odor control. “Part of the program is making sure we are cleaning and sanitizing properly so we aren’t needing to cover up or utilize odor control products,” says James Heck, president of Team MJV, Lafayette, Ind.